Hey all good morning... I have quite a few questions but I will stick with just a couple for now.... I would greatly appreciate anyone chiming in with any opinions and or ideas that could help me out. *** my website is www.josher.biz Under services > car wash I have prices up there $35, 45, and 55... that's for a basic car wash 55-85 minutes depending. NOW the question I have is.... How do I add a price for a 'car wash' for a super car? I know this guy that strictly does lots of high end cars... I mystery shopped him and his was price for a Lamborghini Huracan is $80 dollars... If my prices already say 35,45, and 55... What do i do ? add a page that says 'supercar car wash' ? I believe a car that has a value of 10x or MORE than a regular car should cost more to wash.... especially since I have insurance to cover the more expensive cars as well as the cheaper ones... either way I am stumped how I should sell a car wash to a more high end car owner? home page - a pic with your van unwrapped....sitting duck at the curb.....not the best image you can project for your business. so...lack on info on home page. contact - on all pages i have to scroll down to see the info ...adjust that gap so it loads up in the page. "will travel further for additional fee" , that should be in the services page not contact , what you can include in contact , is "about your business " or about you , or a fill in contact us boxes. Thank you so much for the help you gave me above Cosmin! I will work on all the matters you brought up and adjust them to help improve my business as a whole and website.. I like that you said your mind because that's exactly what I needed.... I am a person of my ways (like most of us are) and I am trying to be a lot more open minded and sometimes it's hard to change habits without some helpful criticism. Regarding my home page 'sitting duck' I already have my Van Wrap finalized.... waiting on the company to print the wrap and schedule me in... I will be updating my home page with a picture of my Van finished and wrapped in the next week or two... That is why I left the home page as is but you're right, it's plain with NOTHING on the home page. My wrap will also include a new logo for my business. I appreciate you pointing out for me to talk about my own business and services and not point fingers at others / gossip or what not. That is the stuff I'm so glad you pointed out because I don't always see things from others views... so thank you for helping me see that. Gallery: Yes .... it's really just my instagram page thrown up with pictures of cars I have detailed... some random pictures and videos of car shows I attend... My vision for my gallery moving forward is to keep it my instagram page but just take pictures of EVERY car I do no matter if it's a wash, exterior detail, interior detail.... or anything I just need to get ALL of my work documented as well as get my van in the background of all or most of the pictures I take of customers cars.... especially since the wrap will have all my info on it, it will act as a watermark copyright per se. Any picture I don't have with my van in the backdrop I will have to include my own watermark copyright. What are your views on this game plan for the gallery? Pictures of ALL my work (quantity - to show how active I am with the work I do) I also want to put up 1 minute or less videos of me doing work from time to time.... what are your thoughts on that as well? The marketing aspect of things so far lays at.... a semi established facebook page (no advertising on FB yet but plan to in near future 1-3 months) Instagram being highly engaged building my account trying to target other IG accounts mainly in my local area.. My newest form of advertising will be my Sprinter Van wrap which will be finished in about 1-2 weeks... i'll try to post an image of the wrap just to show you guys.. (I am not looking for much criticism for or about the wrap as it is final and I am 110% ready to roll with this particular wrap) I don't mind if someone wants to tell me something negative or positive about it, it just won't effect the wraps outcome. (I really have NO clue what to expect from having my van wrapped....) I do plan on parking my van in HIGH FLOW areas quite often whenever it is I don't have work which requires me to use the van..... Also I plan on driving my van WAY MORE as a daily driver rather than my Focus ST to promote my business and services. Again Cosmin I really appreciate the constructive criticism to assist with helping me pin point issues that need to be addressed. I have realized starting a business is NOT EASY but I am excited again and giving it all I got with this new year coming up and my new commitments to myself I have agreed to achieve. Thank you sir. the wrap is too plain , ask them to put some king of background like lines , dots, faded colors... etc, also if the logos of those company don`t sponsor you....i wouldn`t list their logo on your van, you may regret later, or if you don`t have any straight/official connection with them than don`t. with pictures , the best is if you focus on before/after pic with same angles. also the gallery has to represent you, so is good to be king of organized , show quality , or what ever you wanna project. but random and chaos will not bring quality for sure. You're the man Cosmin, Thanks for the great help! Regarding the wrap it is all said and done... like i said i can't take 100 people and ask them to agree on a wrap let alone 5 people.... So I just am rolling with what I got. Regarding the logos I'm a gambling man... Great ideas and advice for the gallery and website!! I need to get consistent with angles like you say befores / afters. I'll come up with a game plan for my gallery and implement it as well as get an updated website feell / look or at least complete... Great idea on the knocking on doors basically... I did create two fliers I am distributing in my direct residential area 2 mile radius... I pass the fliers out randomly and mark the streets / dates I have distributed. I plan to get in many car forums and show up at their parking lot meet n greets... I actually plan on an underbody light kit for those meetups at night. :b Again thank you for the time you took to help me! I most certainly appreciate it! 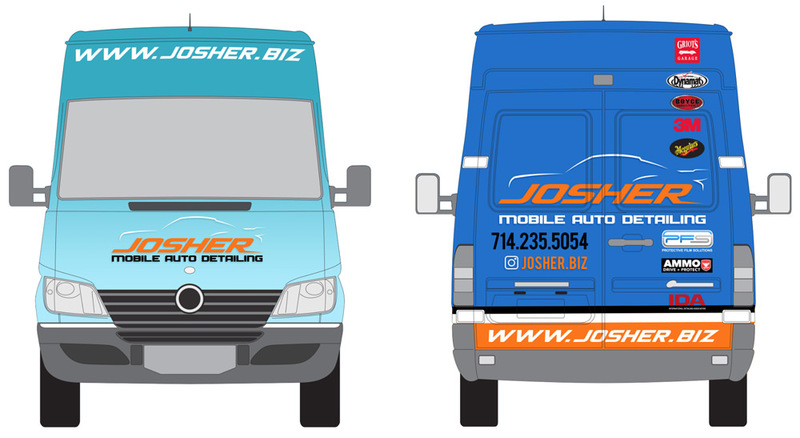 it may be just be but the wrap makes josher mobile auto detailing look like a supplier for mobile detailing supplies . 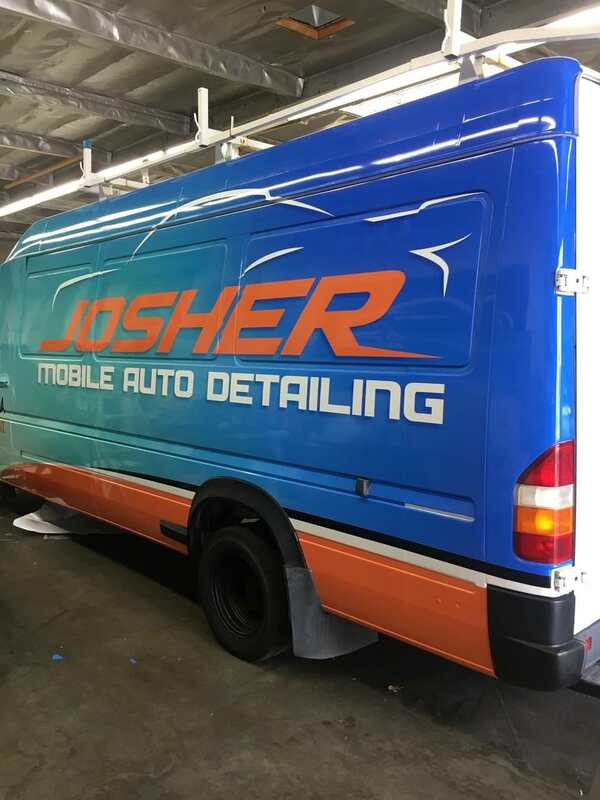 although the wrap is done you may want to think about adding some to it to tell possible clients what josher mobile auto detailing does. might want to come up with a business catch phrase,too; something like,"full service detail from top to bottom front to back." also might want to put on there what else you detail. motorcycles?speed boats?pontoon boats?airplanes? semis? maybe do a search for "mobile auto detailing" and see what others are using there to get some inspiration. make it stand out,too. I'll just hope the wrap 'as is' will help with what I'm going for since it's half way done already.. I definitely need to take you up on your ideas of adding rv's, boats, planes etc.. to my website thank you! And ever since i read your message here the other day i've been trying to come up with a catch phrase lol.... dangit in time, it'll come thank you for your help and comments! I can come back here and re-read what all has been suggested as I'm working on my site. the guys sent me a 'teaser' picture today! I am getting pretty dang excited! lookin good! that catch phrase will come. ya might want to have a notepad handy because "the one" could materialize while youre just driving down the road.